One of the great privileges I’ve had as Marine Corps Times’ managing editor was attending the Marine Corps Heritage Foundation’s 2011 awards ceremony along with our former senior writer Dan Lamothe, whose work a year prior while on assignment in Afghanistan was recognized with the foundation’s first ever Major Megan McClung Award for dispatch reporting. McClung was working as a public affairs officer in 2006 when she was killed by a roadside bomb blast near Ramadi, Iraq. The night of the ceremony, Dan and I sat with Megan’s parents, Mike and Re. It’s with that context that I’m delighted to share this field report from Diana Blass of the Medill News Service. Diana interviewed Re McClung at Sunday’s Marine Corps Marathon in Washington as she waited for the final runner to cross the finish line so she may present the race’s annual Penguin Award. The Penguin Award is given to the last person to finish the Marine Corps Marathon. On Sunday, five hours after the first person crossed the finish line, Suzanne Tschida became the seventh recipient of Penguin Award. 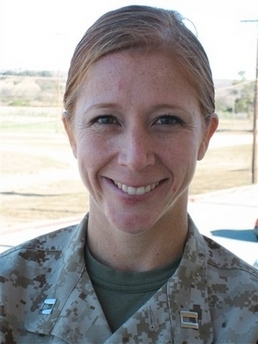 The award honors Maj. Megan McClung, the first female Marine killed in Iraq. Re McClung, Maj. McClung’s mother, has given out the award since 2007, a year after Megan died. The gesture was started in 2006 by her daughter, who organized a marathon during her deployment to Iraq. Megan asked her mother to ship her a stuffed penguin to award to the last person who completed the race. Re McClung said she intends to continue the tradition indefinitely. The Medill News Service is an extension of the Medill School of Journalism at Northwestern University. Marine Corps Times has been a proud client of Medill’s for several years, and I’d be remiss not to compliment the other outstanding work its reporters produced for us during this year’s marathon. Specifically, our race day coverage and photo gallery was provided by Marina Cracchiolo and Tanvi Misra. Tanvi also profiled a couple who came to D.C. for the race motivated by having witnessed the Boston Marathon bombing in April. “He genuinely cared about everybody,” Sgt. Ballard Hall said of Lance Cpl. Andrew Russoli, who died in combat in 2005. 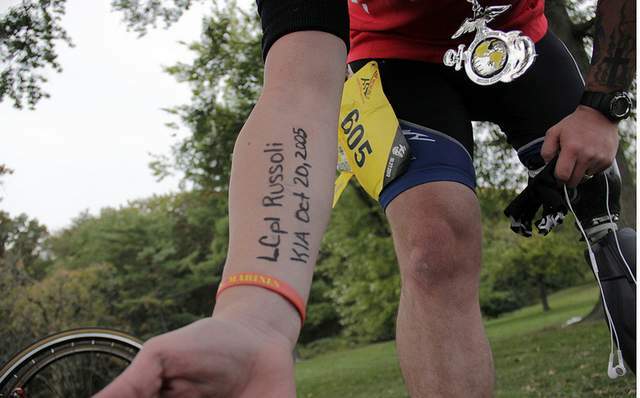 Hall ran the Marine Corps Marathon on Sunday with Russoli’s name scrawled on his forearm. Find more photos from the event here.